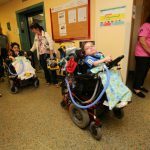 Following on the heels of the April 26 transfer of the Royal Victoria Hospital, the Montreal Children’s Hospital successfully moved 66 young patients to the Glen site yesterday in a well-orchestrated operation. The move took just under four hours. 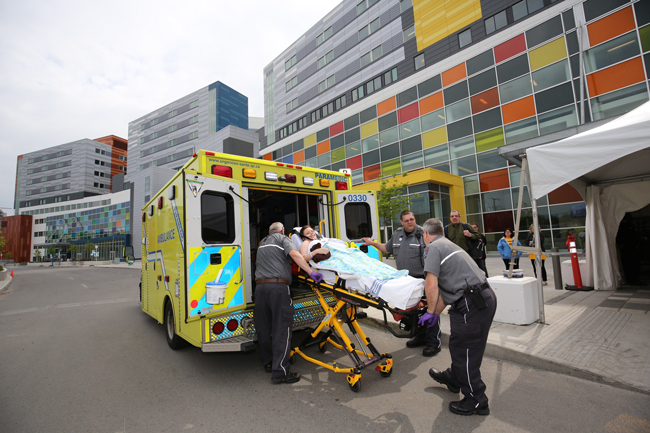 Staff began moving patients to the new facility by ambulance at 7 a.m. 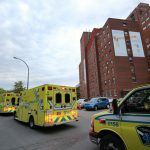 The final patient was transferred a little after 11 a.m., hours ahead of schedule , McGill University Hospital Centre (MUHC) spokesperson Richard Fahey said. 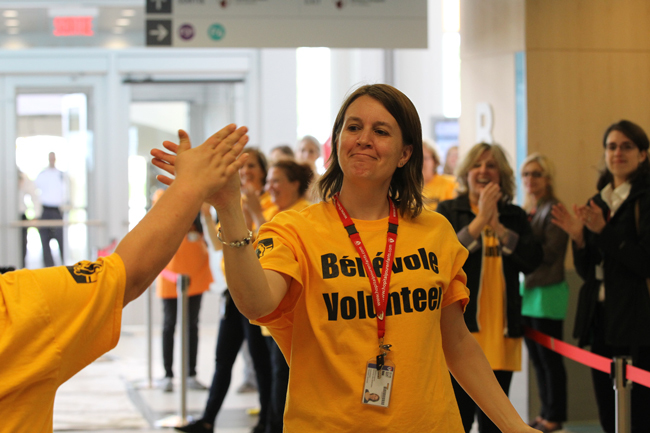 “Countless hours have been put into making today a success and it truly paid off. 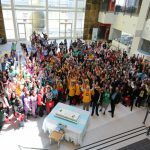 This experience has been both a rare challenge and a privilege for the Montreal Children’s Hospital. 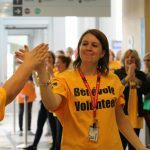 The cooperation and support of everyone involved in this move has been exemplary,” said Dr. Harley Eisman, Medical Director of the Pediatric Emergency Service at the Montreal Children’s Hospital of the MUHC. 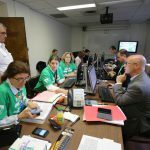 “Healthcare providers, volunteers, Urgences-Santé paramedics, and the staff from Health Care Relocations should all be applauded for their hard work and dedication. “Our patients and families are always at the forefront of everything we do and I am certain they will be very happy in this new home of ours,” said Dr. Eisman, also thanking the support of Médicar, the Ville de Montréal, the City of Westmount, Transports Québec and the SPVM. 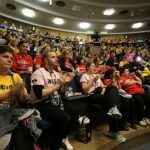 As with the Royal Vic move, hospital staff worked in teams designated by colour-coded T-shirts to make sure the huge operation went off without a hitch. 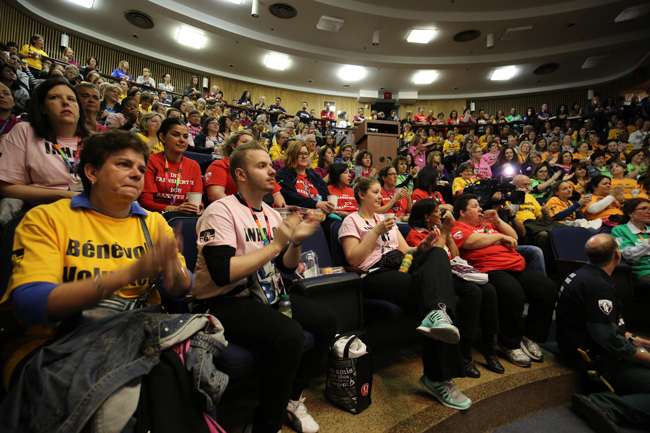 In all, almost 700 people, including staff and volunteers, took part in the transfer. Originally, the plan was to move about 90 patients, but those who were well enough to go home were discharged before the move. The patients were transported by ambulance, one every three minutes, along with a nurse and often a parent. Patients with increased needs were accompanied by a doctor or a respiratory specialist. Each child was welcomed to at the Glen site with a teddy bear, a new blanket and a bag of goodies. Adjacent to the adult hospital, the new Children’s comes complete with 154 single patient rooms, each with a section with large couches for parents to keep their children company both day and night. The facilities were designed with the input of Hospital staff to create efficient spaces that support best practices in pediatric medicine. 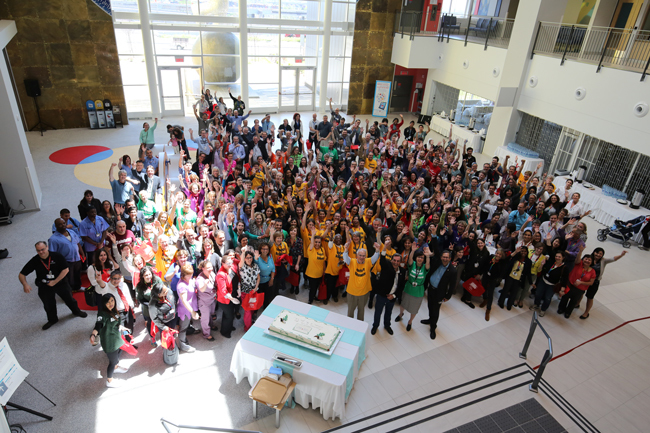 By consolidating operations at the Glen site, the MUHC’s inter-disciplinary teams have the opportunity to come together to share their knowledge, discoveries and resources, furthering their contribution to the advancement of medicine in Montreal and the world. 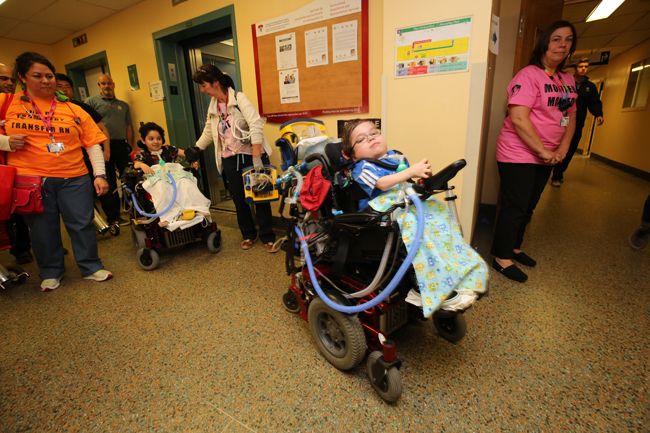 The Montreal Children’s Hospital’s clinical activities will gradually resume at the Glen site. 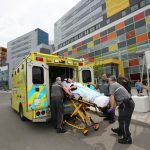 The final phase of the MUHC 2015 transformation will come with the move of the Montreal Chest Institute and some services from the Montreal General Hospital on June 14. Click on the thumbnails below to enlarge each picture. All pictures by Owen Egan. 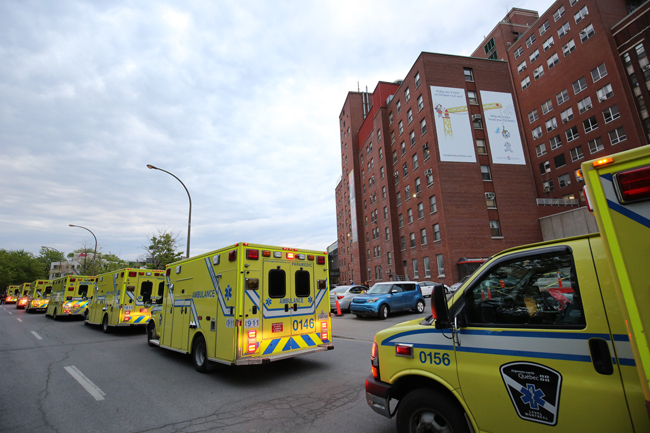 Ambulances line up around the old Children’s Hospital. 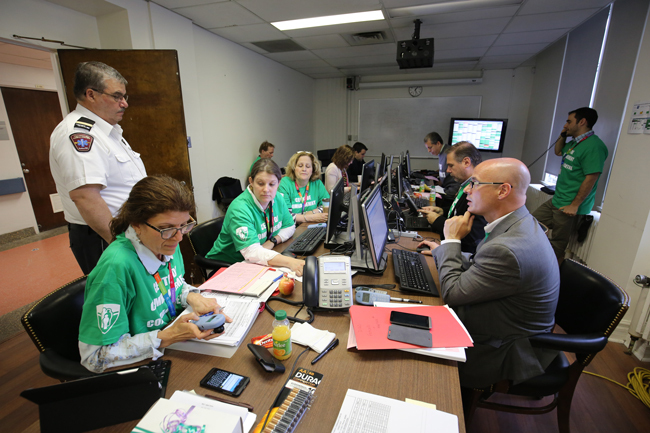 The Command Centre prepares for the start of the transfer. Loîc Bydal (right), 11, and Jouri Abdulmaola, 6, make their way to the Medicars that will take them to the Glen site.